Carol R. Platte died Sunday, February 3, 2019 at the age of 87. He was born December 3, 1931 in Clinton County, MI the son of Ferd and Nettie (Arens) Platte. Carol is a member of St. Mary’s Catholic Church and the Catholic Order of Foresters. He is an Army Veteran and was a dairy farmer. 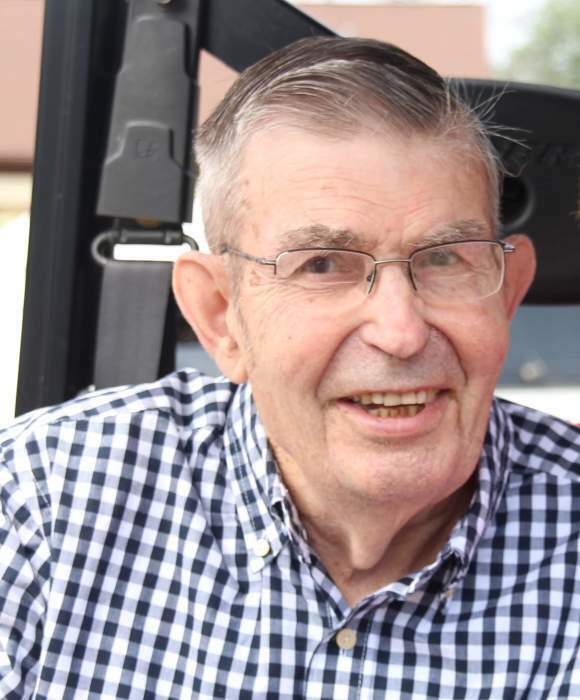 He owned and operated Carol R. Platte Backhoe Service and was instrumental in digging footings for St. Mary’s School, the grotto in front of St. Mary’s Catholic Church and dug graves at St. Mary’s Cemetery for many years. He did backhoe work for the Village of Westphalia with the installation of the sewer and water lines plus many other jobs in the Westphalia area. On June 30, 1962 he married Genevieve “Genny” Thelen and she survives him. Also surviving are his children, Cindy (Dean) Schmitz, Jane (Joe) Theis, Sandy Schmitz (Russell Rademacher) and Bruce Platte; grandchildren, Dylan Schmitz, Brittany (Jarud) Koenigsknecht, Terry Theis, Tyler Theis, Cassie Schmitz, Kaitlyn Schmitz, Holly Schmitz, Brady Schmitz, Halie Platte Hayden Platte( fiancée Angelica), Reece Platte, Weston Platte and Ethan Platte; one great grandson Landon Koenigsknecht; two brothers, Gene Platte, Bill (Connie) Platte; brothers and sisters-in-law, Mary Platte, Bernadette Thelen, Jean Thelen, Regina (Harold) Simon, Rita (David) Witgen, Aggie (Ken) Stump. He was preceded in death by his son and daughter-in-law, James and Tonya Platte; sister and brother-in-law, Dolores (Richard) Fedewa; brothers and sisters-in-law, Marvin Platte, Ken (Joan) Platte and Betty Platte; brothers and sisters-in-law, Bertha (Norbert) Simon, Herm Thelen, Albert (Elaine) Thelen, Anna (Elon) Goodman, Leon Simon, Elmer (Wilma) Thelen and Bruno Thelen. Mass of Christian Burial will be celebrated 10:30 AM Thursday, February 7, 2019 at St. Mary’s Catholic Church, Westphalia with Rev. Fr. Eric Weber as Celebrant. Rite of Committal will follow at St. Mary’s Cemetery. The family will receive relatives and friends 6-8 PM on Tuesday and 2-8 PM Wednesday at St. Mary’s Funeral Chapel, 210 N. Westphalia St., Westphalia. Rosaries will be prayed at 7:30 PM on Tuesday and Wednesday at the funeral chapel. The family was assisted with these arrangements by Keck-Coleman Funeral Home, St. Johns.